“What can we tax that is not paying? 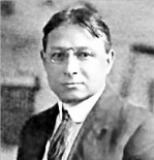 Ellis Parker Butler (1869 –1937) was a writer, editor, and banker. Born and raised in Muscatine, Iowa, he spent most of his life in New York City. Author of more than 30 books and more than 2,000 stories and essays which appeared in hundreds of newspapers and magazines, Ellis published his first story at the age of 13. Several of his works were converted into film, including Pigs is Pigs and The Jack-Knife Man, was turned into a successful movie. Ellis was instrumental in starting the Authors’ League of America. Very clever and skillful rhyme scheme! Thanks for sharing. Perfect selection for tax day!